The Reservations tab is the best place for core customers and facility managers to view the activity in the facility across all resources. It may not always be available to customers, depending on core settings. The Reservations tab can be viewed from your core's homepage. Back in time: Step back in time by the number of days selected under item 3. Forward in time: Step forward in time by the number of days selected under item 3 (Note: if this arrow is not visible, going into and out of full screen mode may make it visible again). You may print reservations for the day across resources by using the "print reservations" link. First, you must select the "one day" view and navigate to the day you wish the print. Then click on "print reservations". The printer window will display. Select your printer and click "OK". Your selected day will print the details of each reservation for the selected day. The "Print Schedules" link allows you to print the entire day's schedule for a single resource. First, you must select the "one day" view and navigate to the day you wish to print. Then click on "Print Schedule". The schedule prints with both a calendar view of the reservations, and a chart print of the reservations. Legend: If you click on the question mark icon, a key will display that details what each color on the calendar means. Full screen: Click on the diagonal arrow icon to switch the screen to full screen view. In full screen view, click this icon again to return to the windowed view. On the right side of the calendar, you will see the Select Resources panel. 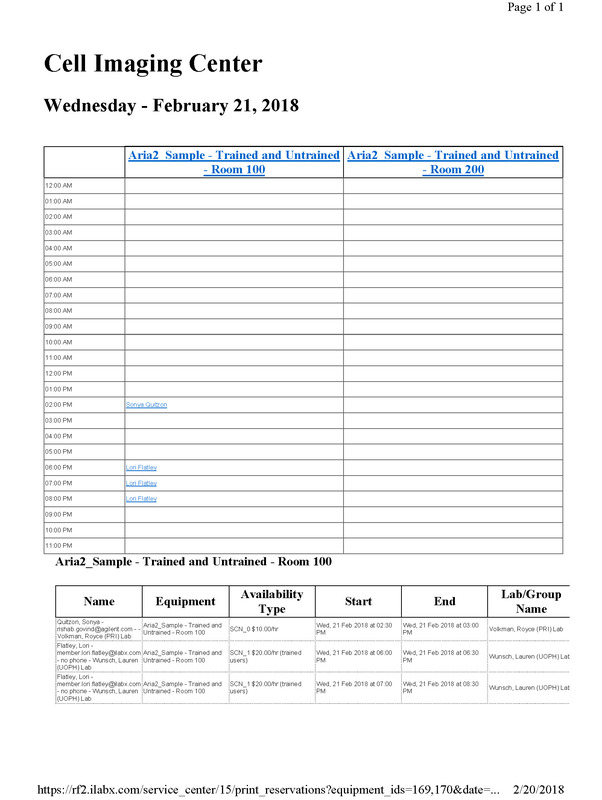 This panel provides several different ways to search for and select resources to display. Select: In the Select section, you may select any one of the pre-defined filter parameters to view. "My subscriptions" displays calendars of resources to which you have subscribed. "My favorites" displays calendars of resources you have designated as a favorite. 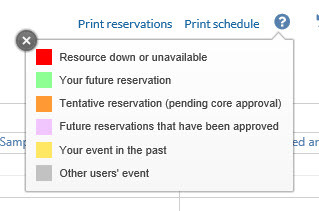 "Schedules with events" will display only calendars that have future reservations. "All" displays all resource calendars. "Clear" clears all previous calendar selections. List Style: You may select to display resources either alphabetically or by category. Select by category: You may select to display resources by their category/classification (designated in their Settings‍ ). All categories/classifications will display in this section. Click the tick box beside the category to see all resources associated with that category. Click it again to de-select. Hide/Show: Click this arrow to hide or show the resource selection panel.